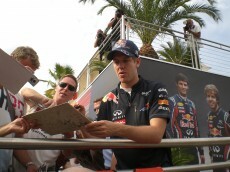 Similiar to Jenson he just wrote 1 autograph per meeting. On Thursday he was very relaxed, but on Friday he was a bit stressed and escorted by McLaren PR officers. On the one hand he was very kind and friendly, but on the other hand he was in a hurry and not writing. Meeting him was like rain and sunshine. 1 autograph per meeting was possible. Seemed not to be down to earth. The way he was writing wasn’t nice. After the second autograph he asked strange questions. He was surprisingly hard to collect. His father caught him up at the paddock gates to drive away to their motorhome. He still tries to be kind, but it becomes more and more difficult for him. He wrote 1 autograph per meeting, sometimes he wrote his full sign. He was in a good mood during these days at Hockenheim, may be because his Ferrari was fast enough. He often signed his full surname. He wrote OK, but his sign is not good to collect anymore. He was writing nicely, but not that much as in the past. He shortened his sign since the beginning of the year. 2-4 autographs were possible, even he seemed to be angry with the collectors. Great! He his fast at the race track and nice to all the collectors. Thumbs up! He changes his signature from race to race, because he has o shorten up the sign due to the high number of autograph requests. Every collector gets his autograph, but from the second sign on it is getting worser and worser. He remembers every hunters´ face. So from the second meeting on he wrote dedications. He was one of the most requested autographs at Hockenheim. He was very kind and talked to the collectors. Sakon Yamamoto pushed him into the second row. He seemed to be disappointed and wrote just 2 autographs per meeting. He wrote OK, but not as much as Pedro. Without any problems, sometimes he wrote his full sign, like many years ago.